Reflecting on 150 years of communist theory and practice within capitalism. "Revolution on the continent is ripe and will quickly assume a proletarian form; but will it not be snuffed out in the bud by the nascent capitalisms of Russia and China, where bourgeois society is still in its embryo?" "In all previous revolutions, the opposing sides confronted each other openly: class against class, program against program. In the present revolution the troops protecting the old order do not intervene in the name of the ruling classes, but under the flag of a "Social Democratic party". If the central question of the revolution was posed openly and honestly: capitalism or socialism, no doubt or hesitation would be possible today for the great majority of proletarians." We live in a world in which few if any important questions can be posed "openly and honestly". That world is 25 years into a crisis that has wreaked devastation in much of Latin America and Africa, that has seen serious material retrogression for millions of people in North America and even more in the former "Soviet" bloc (the soviets lost all real power by 1921), and that now menaces western Europe with the "Brazilianization" ("flexible" work force rotation perfected under the 1970's dictatorship) which the capitalist press calls the "American model". The "American model" has meant a 20% fall in living standards for 80% of the U.S. population since 1973, one-third of the work force reduced to temps and part-timers, and a (predominantly minority) prison population headed for 5 million by the year 2010. However disparate the immediate causes may appear, the names Lebanon, Iraq, Afghanistan, Chechenia, ex-Yugoslavia, Liberia, and Rwanda conjure up realities of barbarous destruction that are all part of a single historical period, and a single world crisis since the early 1970's, in which fragmentation and dissolution appear (and are made to appear) as the sole alternatives to the dominant "world order". Since 1985, i.e. the beginning of the Gorbachev period, Russia's average life expectancy has fallen one year per year from 69 to 57, the biggest demographic disaster ever recorded in peacetime. It is all one world, and it will get worse before it gets better. The 1920 and 1921 (2nd and 3rd) congresses of the Communist International pronounced capitalism a decadent mode of production on a world scale. Subsequent events give this assessment a certain weight. The 1914-1945 period, with two world wars, a global depression, fascism and Stalinism, was a period of (theretofore) unprecedented destruction. The expansion of 1945-1975 has to be seen against the backdrop of that destruction, the latter preparing the way for a new phase of accumulation, and the period since 1973-75, our own, is well on its way to exceeding that destruction. More people in the Third World have died since the 1973 "oil shock" (the event which, more than any other, symbolized the end of the post-war boom) for preventable economic reasons than died in combat in World War II. And it should not be forgotten that even during the post-1945 boom, the world was not at peace for a single year,1 in total contrast to the classical age of capitalism from 1815 to 1914. The Communist International made its assessment of the decadence of capitalism in the midst of the last worldwide explosion of the classical workers' movement. The Russian and German revolutions of 1917-1918 were the high water mark of an upsurge that deeply shook twenty countries by 1921.2 Nothing comparable has happened since. Nothing comparable has happened since, and the world in which we live is paying a terrible price. The 1917-1921 period marked a unity of working-class offensive that dwarfed the preceding international conjunctures, in which communist expression was still in its infancy (1789)3 or a small minority (1848), or isolated as a minority within one country (the Paris Commune of 1871). Communism, the real movement, was a minority in 1917-1921 as well, but it was able to make its mark on events far more than before or since. Without getting into the question of whether the world was ripe for working-class revolution immediately after World War I (in my opinion, it was not, but, understandably, things were not so clear to the best revolutionaries of the time), 1917-1921 remains the threshold beyond which a future unification of conditions will have to go. The statist century from 1875 to 1975 was the Social Democratic era. It is over. It will never come back, because capitalism on a world scale no longer has room for it. And a revolutionary left today, worthy of the communist movement, has to forget the blunders inherited from that past. Blair, Jospin, or Prodi, like Mitterand, (Felipe) Gonzalez or Papandreou before them, are no more "Social Democratic reformists" than were Margaret Thatcher or Ronald Reagan, whose policies they mimic and tart up in "social" demagogy; they are merely administrators of capitalist austerity, like any other bourgeois politician, inhabiting the dead carcass of a failed movement, who in their many years in power since 1975, often with solid parliamentary majorities, have never implemented a single "reform" anyone remembers. Even in the United States, the old apparatus of pseudo-left containment is gearing up to relive the 1930's, (during which the American working class, it should not need to be pointed out, was defeated) but figures such as Sweeney and Carey are not even of the stature of Walter Reuther, and any "left" government which emerges out of the liberal wing of the Democratic Party, or its ginger people in the Labor Party or New Party, will not even have the staying power of FDR. The real impact of such politics on the actual working class is to increase the appeal of the racist far-right. The latter at times seem to be the only visible group speaking directly to the working-class rage built up during 25 years of crisis, and of which the slick academic-yuppie stratum populating the apparatuses of "Social Democratic reformism" in most countries has barely a clue. In Belgium, in France and in Austria, the far right has already established itself, with a certain working-class base of support, as political arbiters against tacit or overt "grand coalitions" of the official "right" and official "left". Hic Rhodus, hic salta! Here is the rose, here we dance!" The remainder of this article, flowing from the situation in which we find ourselves 150 years after the Manifesto, will attempt "to return what has already been accomplished in order to begin the task again". Nevertheless, the conditions of 1997, on the surface at least, hardly evoke any triumphalism or even optimism about anything except Marx's prediction that the long-term prospects for capitalism were "socialism or barbarism." To¬day, while it may not be five minutes to midnight, it is late in the day, and the barbarians are winning. It has often been noted, though rarely with any insight, that Marx's ideas seemed to have greater impact in semi-developed or undeveloped societies, beginning with Germany in the 1850s and extending into Russia in the 1870s, and finally into the colonial, later "third world," by the 1920s, than in the mature capitalist societies (e.g. Great Britain or later the U.S.) which Marx saw as the most likely places for a transition to socialism. Today, when it has been made clear beyond dispute that the "really-existing socialism" which resulted from this apparent anomaly was in fact a long statist detour to capitalism (with China as the latest, and most resounding example), the great irony is that any broadly-held vision of a positive alternative beyond liberal demo­cratic capitalism has all but evaporated. But communism, for Marx, was no more a "vision" than a doctrine or a political organization. 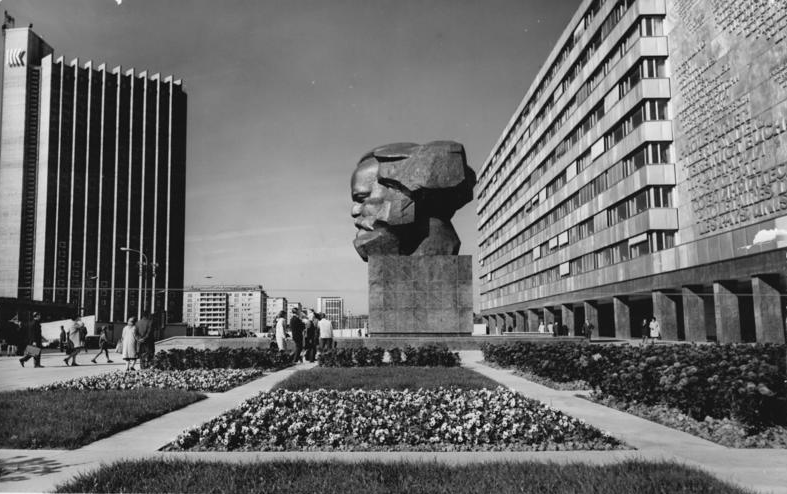 The issue today, in locating the old mole, is to locate what may be called the "negative presence" of communism, the visible manifestations of the fact that, on a world scale, the existing forces of production are in revolt against the dominant relations of production. The most fundamental aspect of the tendency is the inability of capitalism to translate gains in the productivity of labour into gains for society as a whole, forcefully demonstrating that capital is antagonistic to any idea of society. At times it seems that all contemporary reality conspires to demonstrate the truth of Marx's assertion that capital can only be capital by a relationship to living labour. The manifestations of the post-1973 world crisis in the United States are a perfect illustration of this; the 8-hour day was a central demand of the U.S. labour movement over a century ago; it was broadly won in the 1930s and 1940s. Since 1973, labour productivity has advanced fairly steadily, and a larger total product is created (on a global scale) by fewer people at lowered costs. Yet, at the same time, what has happened to the U. S. work force? Real wages have declined by over 20 percent; the average work week has increased by 20 percent (from 39 hours to 47); the eight-hour day has faded away for most employed people while one tenth of the population is consigned to total marginality. For good measure, the average Americans who paid 15 percent of their income for housing in 1950 are now paying 40-50 percent. Such devastating figures, expressing the long-term movements of the capitalist law of value (and the manifestations of value in profit, interest and ground rent) show beyond any doubt that "progress" for capital has become retrogression for society. The capitalist gains in productivity translate into an unabated rollback for the created in which capital, to survive, must engender vast social destruction. Such a situation, in which capital must destroy labour power to reassert itself as capital, has been endemic to every capitalist crisis since the beginning, but, until the 20th century, always on a restricted scale. What is unique and novel about the current crisis is that the scale of this destruction is planetary. The fundamental contradiction of capitalism is that it needs living labour power as the standard of value, and at the same time its perpetual innovation tends to expel living labour from the production process. From the South Bronx to South Central L.A., millions of ruined and stunted lives are palpable evidence that in this system, human beings exist for the "economy" instead of vice versa, and that human beings of no use to the accumulation of capital are discarded onto the social scrap heap, criminalized, and used by the system to rationalize and legitimate its own barbarism. The simultaneous coexistence of a significantly increased labour productivity and significantly lengthened work week is a flagrant demonstration, beneath and beyond the chatter of politi­cians, the media and academia, of the priorities of the system. It is by now largely forgotten that in the months prior to the outbreak of World War I, which set the stage for the first worldwide proletarian surge of 1917-21, virtually every country in the world was heading into deep recession or depression, inaugurating the "thirty years 'War'" of upheaval, 1914-1945. It is, of course, impossible and vain to predict the timing and nature of the next unitary breakdown of the system on a world scale, but it is essential to understand our situation as suspended between the past and future moments of rupture, as the sole adequate measure from which to judge the day-to-day diggings of the old mole. It is in these situations, as in 1789, 1848, or 1917, that the system becomes vulnerable. And it is essential to see these moments as not merely the mechanistic result of some historical clock, but rather as situations in which the action (or its absence) of the working class is decisive in the outcome, a kind of global conjunctural realization of Marx's 11th Thesis on Feuerbach. The victory of communism is in no way a foregone conclusion. "Socialism or barbarism" remains the most condensed result of scientific thought at the end of the 20th Century. Nevertheless, away from the glitter of capitalist self-congratulation about its undisputed world hegemony, the conditions of the next eruption of the old mole are coming together. 150 years after Marx and Engels wrote The Manifesto, this is perhaps the best tribute of all. 1. The journalist Patrick Brogan, in The Fighting Never Stopped: A Comprehensive Guide to World Conflict Since 1945 (New York, 1990) estimated that post World War II "local wars" in 50 countries had killed more than 20 million people, and that was only through 1989, and thus before many of the conflagrations mentioned above. 2. There was hardly anywhere in the world that was not rocked in some way by the post-World War I upsurge. Lloyd George and the British cabinet were all but convinced that revolution was imminent in January 1919; a period that saw the brief Hungarian and Bavarian soviet republics, potentially revolutionary situations in Vienna and Warsaw, the Italian "Red Year" of 1920, the French strike wave of 1919-20, the 1919 strike wave and Seattle "soviet" in the US., the 1918 rice riots in Japan, and many uprisings in the colonial world, culminating in the 1925 Rif war in Morocco and the 1919-1927 years of revolt in China. 3. Cf. C.L.R. James, The Black Jacobins (1963), Chs. IV-V, on the remarkable dialectic between slave revolt in the colonies and revolution in the metropolis already present in the epoch of the French Revolution. 5. The remaining Social Democratic parties of any significance, led by the Germans, are falling all over themselves to abandon the "welfare state" which was their hallmark, to fight with the "right" about who best administers neo-liberalism. Their lingering credibility in the working class remains a card which has not been fully played, however frayed it may be after the fiasco of the "Euro-socialist renaissance" proclaimed by Michael Harrington in 1982 when "socialists" ruled in France, Spain and Greece. 6. Grundrisse, (1973), p. 325.